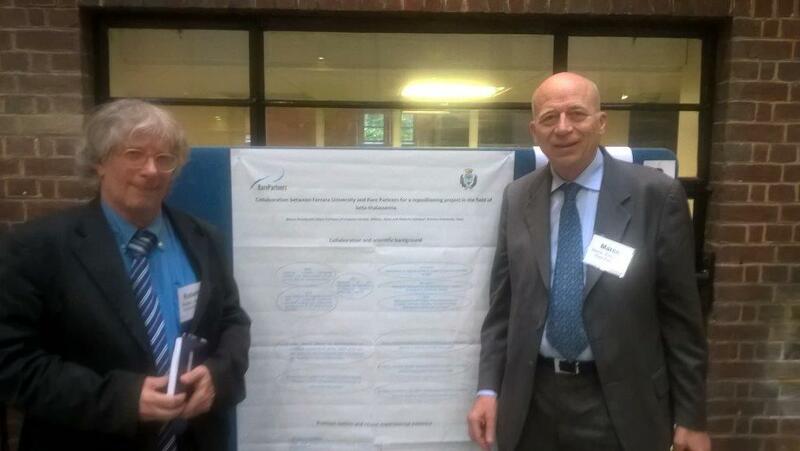 June 2016 - Rare Partners, the Italian non profit dedicated to rare diseases, has presented a poster entitled "Collaboration between Ferrara University and Rare Partners for a repositioning project in the field of beta-thalassemia” at the Symposium “Advancing Rare Disease Drug Discovery: The Need for Successful Collaborations” held on June 23 in London, UK. The authors of the poster are Marco Prosdocimi, Managing Director of Rare Partners and Roberto Gambari, Director of Thal Lab at the University of Ferrara. The poster highlights the importance of the collaboration between patients organizations (in this case Associazione Veneta per la Lotta alla Talassemia), academic research and a pharmaceutical non profit company in terms of advancing a research project toward clinical development. In particular, interaction with Regulatory Authorities has been successfully managed, up to obtaining Orphan Drug Designations by both EMA and FDA. In the same meeting professor Gambari gave a presentation, as an invited speaker, entitled “Orphan Drugs and Treatment Options for Beta-Thalassemia“, explaining how Thalassemia presents a major medical need. Marco Prosdocimi commented ”the presentation at a meeting specifically devoted to collaborations in the field of rare diseases of what has been achieved through the joint efforts of a leading research group and our company is of great significance. We strongly believe that clinical trials with Sirolimus, the first product studied during the collaboration, in Thalassemia patients are now warranted. Rare Partners is strongly engaged in securing funding for this step”.